Back story quests serve as a storytelling tool, as they almost never have any impact on the main character of the game in the present. 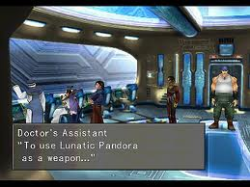 During back story quests, the player will be asked to either fill their own role in a past event, or fill the shoes of a different character of certain significance to themselves. Backstory quests allow the game designer to flesh out the story much more, give specific insight into past character development or events in the world, and give the player a better understanding of the grand scope of things. Event: the specific event in the back story that is being flashed back to. Role: the role taken on by the player, if applicable. This might be the main character with altered stats/items, or a completely different person. Final Fantasy 8. In the Laguna Missions, the player takes up the role of an unknown soldier fighting for the government the player is fighting against. His missions reveal much more about the story leading up to the events of the game. Planescape: Torment. A side quest has the player explores the Nameless One's tomb, with the goal of learning more about the Nameless One's (and allusions to Morte's) past (event). The tomb can be explored only by the Nameless One (role), as navigation requires the explorer to be immortal. Contextualizing Quests - back story quests are related to contextualizing quests in that both have the purpose of teaching the player more about the game. Evolving Environment - Back story segments can take place within evolving environments, to show an even earlier stage of an area you are adventuring in. Inspiration for including the back story quest pattern came from the identically named pattern in the Scriptease quest pattern library.